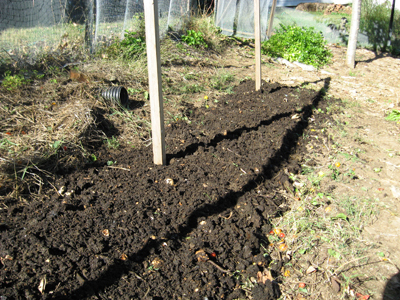 I took out a wheelbarrow-ful of beautiful, dark, crumbly compost a few weekends ago, and photographed its relocation: where the cherry tomatoes used to be, and where the peas will be next year. This is the most challenged of all of my garden beds. It is at the top of the garden, the most steeply-sloped, and the dirt only goes down a few inches before becoming riddled with small shale rocks. It is a ledge masquerading as a garden. I will never plant root vegetables there. 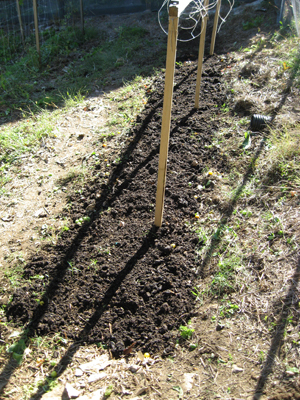 But, I hope, with a generous application of compost, I can build up that area enough that my pea plants will feel at home, and will produce bountifully for me next spring. Also, its position at the top of the hill means it is in the most advantageous spot for the early spring sun. The dark dirt contrasts with surrounding weeds and heavily-trod paths. 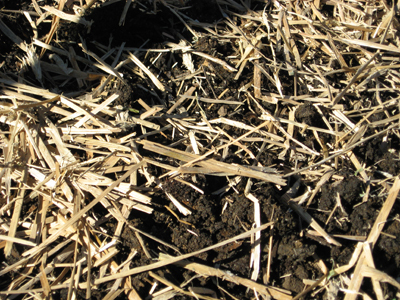 I sprinkled straw over the compost to help hold it in place during winter's wet. I want this stuff on the beds, not the paths. What’s next? Refilling the compost bin as quickly as I can. I have 9 more beds to go!